If you're looking for an adventure, you've found it. 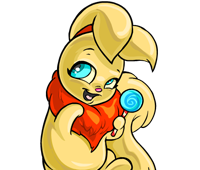 Take Rohane, a white Blumaroo, on an epic journey through (and far beyond) the lands of Neopia! Good luck saving the kingdom � you'll need it! You are about to send feedback on NeoQuest II. We would appreciate it if you could give the game a rating out of 10, and also tell us any additional comments you may have. Thank you for your feedback on NeoQuest II.